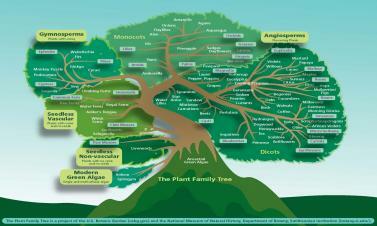 Our Plant Family Tree presents a selection of well-known plants arranged according to their evolutionary relatedness and age of diversification.The ancestors of plant families located on the tree's lowest and "inner" branches evolved earlier in the history of plants than those found on the upper and outermost branches. Plants located along a branch are more closely related to each other than to families on different branches. Interested in starting a garden at your school? The School Garden Wizard is an online resource created for America's K-12 school community in collaboration with the U.S. Botanic Garden and Chicago Botanic Garden. Gardens offer a wonderful, creative space for children of all abilities to achieve something real that is valued by others. Gardening stimulates even as it focuses and calms, and it requires a child's intellectual, emotional and social engagement with things that must be measured, counted, weighted, arranged, planned and cared for - and can yield gratifying and often surprising results for teachers and students. Gardening and plant-based learning open a door to discovery of the living world. Looking for more classroom resources? Contact USBG Children's Education Specialist Lee Coykendall. Please also see our Programs & Events for upcoming teacher training programs at the U.S Botanic Garden.